I think I would probably be pigeon-holed as “anti-infrastructuralist” (if there were such a word), but I am not actually against infrastructure per se. However, there are three key points: (1) I will certainly be long dead before the UK has anything like the kind of infrastructure that the Netherlands enjoys, (2) the so-called “cycling infrastructure” we have here is generally rather dangerous if you use it, and (3) talking of “cycling infrastructure” without thinking about all of the other contextual issues does not make sense. I’ll say no more about (1), but will expand on the others. Regarding (2), we do not currently have the kind of infrastructure that exists in Holland, so the only safe approach right now, based on my own experience, is vehicular cycling. 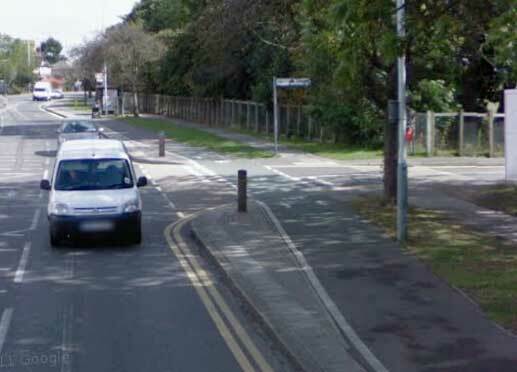 Unfortunately, the pathetic cycle lanes that exists on my commuting route actually make vehicular cycling more difficult because they damage my ability to negotiate with other vehicles. 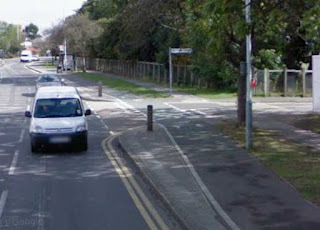 This causes conflict: “you should be in the cycle lane” (i.e. the gutter). Regarding (3), in Holland, you have Presumed Liability, which means that in a collision between a cycle and a motor vehicle, it is presumed to be the the motor driver’s fault unless they can prove otherwise. Here, the cyclist has to prove that the driver was negligent, which is difficult even though they usually were. You also have a long history of high cycle use. I think one of the consequences of these is that drivers in Holland treat cyclists with more respect. 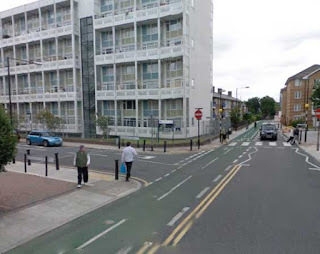 For example, it is unthinkable here that there might be a place where cycles cross the path of motor vehicles and the cycles are given priority! In our car-centric culture, that would be considered far too dangerous. For example, it is unthinkable here that there might be a place where cycles cross the path of motor vehicles and the cycles are given priority! No it’s not. I can show you plenty of photographs of this. 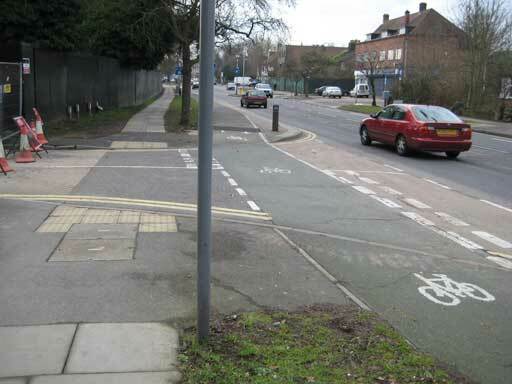 where cycles cross the path of motor vehicles and the cycles are given priority! Some of these are my own photos, and some drawn from Google Streetview. All are in London. There may be similar examples in the UK outside London, but I am not aware of them. These are all cases where side roads give way way to a segregated cycle track. I said I could show "plenty" of such photos. I think that's enough. 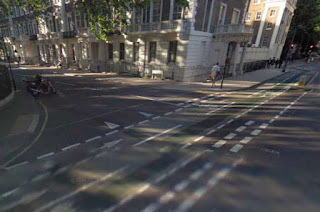 These are examples of a track being signalised where it crosses a major road, with the bicycle flow treated as a proper flow of traffic to be signalised in the standard way, not treated like a pedestrian flow (the common misunderstanding amongst UK cycle facility designers), to be given buttons to push. The point is not that at least one of these facilities has been rebuilt wrongly since the photograph was taken. (The photos of Cable Street are from the Google Streetview survey which predate the recent Cycle Superhighway work. Since I have not been there since, I do not know if these junctions are the same now as then.) 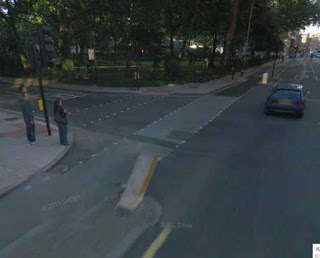 The point is also not that other junctions on these same routes, not shown here, may have been done wrongly. it is unthinkable here that there might be a place where cycles cross the path of motor vehicles and the cycles are given priority! It is not unthinkable because it has been done in the past and could be done again. I know these examples are not the norm, and that the reverse is far more common. That, again, is not the point. But this extreme pessimism, this utter disbelief that correct engineering for cyclists could ever be accomplished in the UK, is quite common amongst UK cyclists – or at least, amongst those who put opinions on these matters into print. These people are, effectively, "anti-infrastructuralists", rendered so by this fixed belief in the impossibility of things being done right, though, as Grahame Cooper implies in his comment, this may not be quite the same mindset as held by those who believe that all cycle infrastructure is bad by definition. Nevertheless, the result is the same. They say they do not want cycle infrastructure, and don't campaign for it. I will certainly be long dead before the UK has anything like the kind of infrastructure that the Netherlands enjoys. I am assuming that Grahame does not actually know that he is going to be dead within a five years or so, because he has been diagnosed with something incurable. If I am wrong in this, please forgive me for my insensitivity. But I don't see why anybody in good health and under the age of threescore year and ten should come to this conclusion. 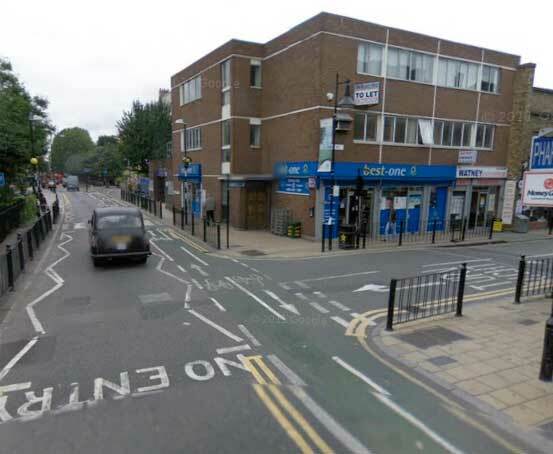 However if the answer to those main roads is segregated facilities, we first need to work out how we persuade politicians and traffic planners to allocate the road-space and the funding needed for these to work well. The last thing we need is yet more of the dreadful "white-lines-on-pavement" cycle facilities which are generally a lot worse than useless, creating hazards and conflict for pedestrians and cyclists alike. Cyclists rightly avoid them like the plague, yet they get shouted at by drivers for doing so. 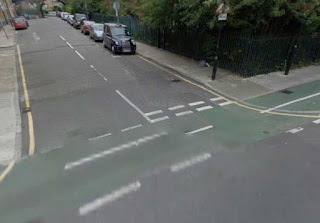 Yes, we all know about those "white line on pavement" cycle facilities, or, worse still, no white line on pavement "shared facilities", but those are not what the campaign for proper cycle facilities is about. They are completely irrelevant. Nobody is asking for those, and talking about them is a diversionary tactic. The trouble is, in asking for nothing in terms of infrastructure, CTC actually contributes to the vacuum that allows these to come into being. My experience, which I have discussed before, but which I come back again to here, is that on the one occasion (to my knowledge) when a UK cycling campaign did take a clear policy decision to campaign for Dutch-style urban segregated cycle tracks (Camden Cycling Campaign at the end of the 1990s), and did so, and specifying, in full technical detail, exactly what it wanted to the local authority, it actually got what it asked for: a high-quality Dutch-style cycle track, with full priority over crossing traffic, which actually works, and which has been a success ever since: the Royal College Street track shown in my first two photos in this post. 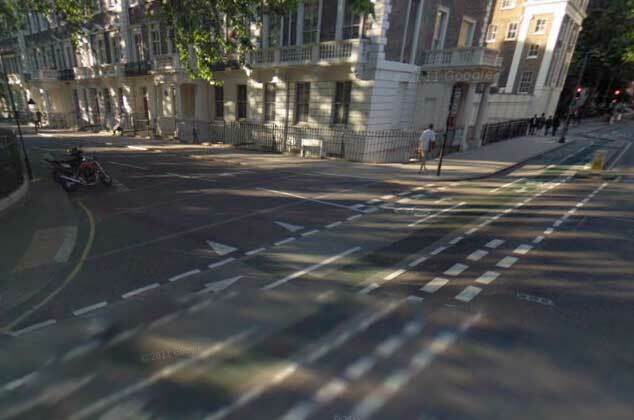 But the subsequent attempt to create a much longer east-west cycle track across central London (the Seven Stations Link), implemented parts of which are shown in my photos 3–7 above, failed, in part, because of the lack of support of other cycling campaigns. 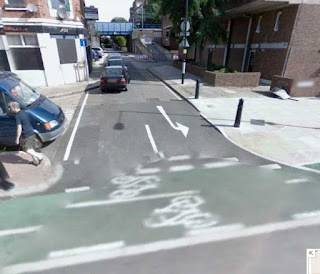 There were other factors in the failure, as I explained before, but one major one was that the neighbouring groups of the London Cycling Campaign did not really support the concept of the segregated track, and so did not persuade their councils to support it. This brings me to my brutal conclusion – "brutal" for what it says about what one hundred years of British cycle campaigning has achieved, or not achieved: the bald fact of the matter is that, with the only exception, to my knowlege, of the Camden case, UK cyclists up until now have never asked for Dutch-style infrastructure, and that is why they have not been given it. 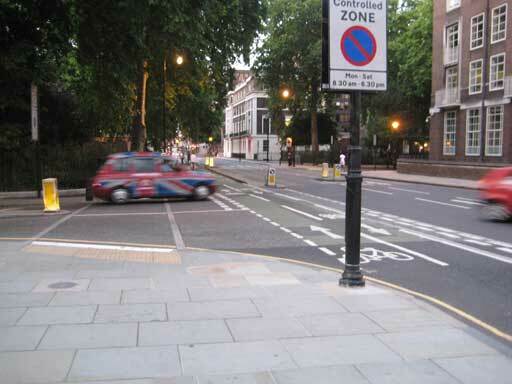 As it says in the Bible, "Ask and ye shall be given..." The British cycling organisations have, nationally, never clearly referenced the Dutch-Danish model of cycle provision, nor said clearly and explicitly to government "We want that here". Instead, all too often, activists have busied themselves trying to find spurious reasons why "Britain is different" and why "It can never happen here". One favourite excuse (which I haven't heard so often recently) always used to be: "It is because of the war" – something to do with the Second World War was supposed to be responsible for why the Dutch and Danes were able to find space for cycling whereas the British could not – but how come the Swedes, Swiss, Finns and Germans have also found so much more space than we have, when these countries all had totally different wartime experiences? 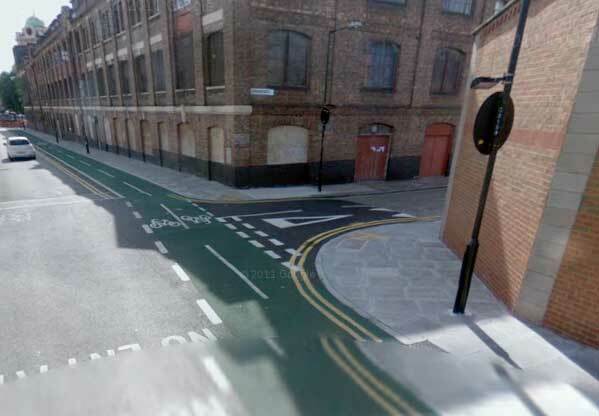 A more common excuse today is to say that "Our cities are old and so our streets are too narrow for cycle tracks". Richard Mann of Oxford develops this line in the discussion on the As Easy as Riding A Bike post with which I started. Needless to say, I reject all of this manifest nonsense, and many other British cyclists are now doing so as well, in large part due to far better information than we used to have on the "nuts and bolts" of Dutch and Danish provision now available from sites such as A view from the cycle path and Copenhagenize. So things are changing. LCC members have now voted to campaign in the 2012 mayoral elections on the theme of "Going Dutch". 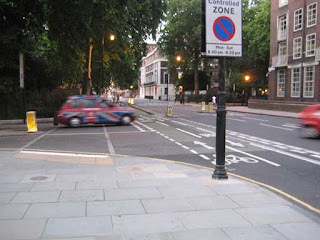 And, perhaps more significantly, we have a new national organisation specifically set up to campaign for effective cycle infrastructure: the Cycling Embassy of Great Britain. Far from believing that I will be dead before we get to see proper cycle networks in the UK (I am now 48 and not intending to die soon), I believe that if the UK cycle community really united around the idea of pushing for high-quality facilities on the Dutch model, we could have the backbone of the network we need in less than 10 years. We could have much of it in 4 or 5 years. UK cycle campaigners so often get wrong the relative time-scales of "changing fabric" versus "changing attitudes". They often concentrate their efforts on the idea of trying to "change attitudes", when this is the hardest thing to achieve in the absence of change in the physical environment, and certainly a project that will not bear fruit quickly, if ever, in the absence of physical change. In contrast, "stuff" can be built quickly. And if it fails, it can be changed quite quickly. Our streets are constantly being rebuilt – usually badly. I firmly believe we could get a network that would transform the experience of cycling in all our cities in a very few years if we all pushed concertedly for it. 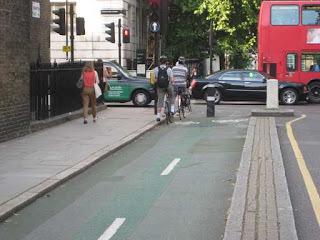 But to change the typical attitudes of motorists towards cyclists will take far longer, and I am not convinced, on the experience of the past century of campaigning, that this ever happen, while cyclists remain such a small minority group, in the current physical environment. There are extreme pessimists in every situation. I talked about Libya in my last post. In a news report on Libya the other day I heard an intelligent Libyan man, an engineer, lamenting the current revolution and saying that he wished his country had never risen up against Gaddafi. Things had not been perfect under Gaddafi, he said, but they hadn't been that bad either, and the country had basically worked. He could only see chaos and destruction in the future and things getting worse. He believed "Libyans are Libyans", and were capable of nothing more than running a corrupt, nepotistic, backwards, tribal system. He had no optimism for his people in the future at all. In every situation, there are always people who, for fear any change will be for the worse, never want to rock the establishment boat at all. 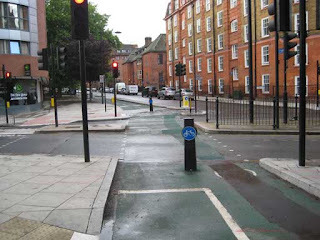 If you believe that, for some reason, analogous to what the Libyan engineer believes, there is something "wrong" with the UK which means that we are incapable of arranging a good environment for cycling, that it will never happen, no way, no how, then you will not join the Cycling Embassy of Great Britain, because you will believe this campaign is totally wasting its time. You will not come along to the Embassy's official launch, on Saturday 3 September, the day before the London Sky Ride, at Lambeth Bridge in London, and you will not take part in the picnic in Victoria Tower Gardens that afternoon. Neither will you arrange you own local Cycling Embassy inaugural picnic, nor will you try to spread the word of good infrastructure practice to your local authority. You will certainly not donate any money to the Cycling Embassy, nor give any of your time to it. 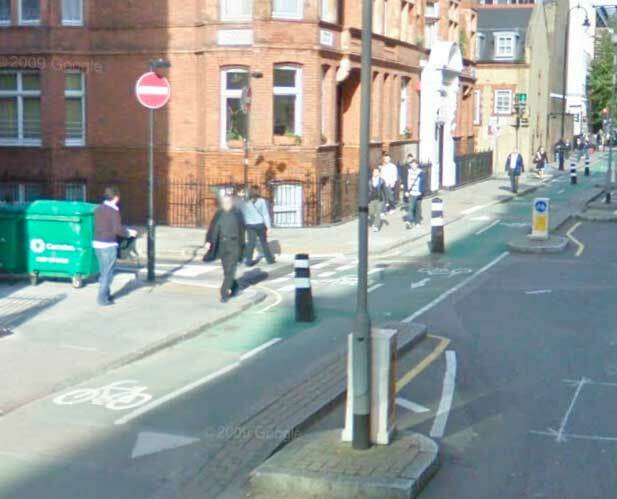 Because to you, the Cycling Embassy is running a pointless, futile campaign. But some other people believe that it is worth trying to change things. 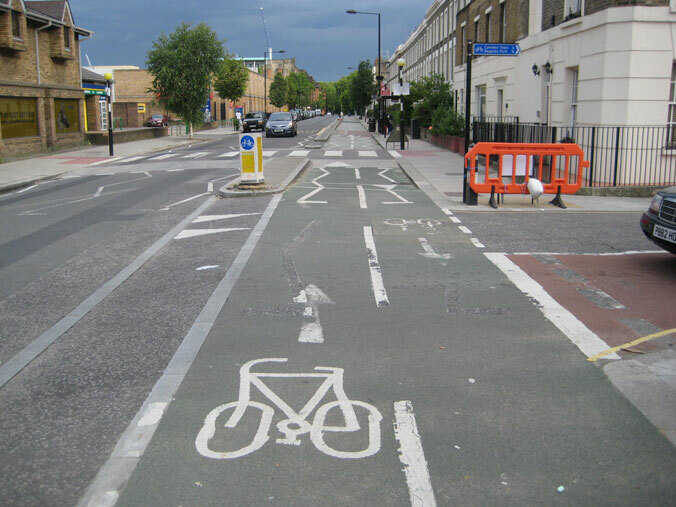 They believe there is nothing fundamentally "wrong" with the UK that prevents the bike from being properly catered-for here. They believe there is just a chance that if we start to demand, loud and clear, a decent cycling environment, we could start to get it. I hope and expect they will be out in force for the Cycling Embassy of Great Britain official launch on next Saturday, 3 September. I find it as pointless to argue with people who oppose dutch infra in UK as it is to argue with a creationist. Mainly beacuse they are hardly interested in listening to any evidence or adjusting their stance in light of new circumstances. So well done on showing us great examples that it is obviously possible to create quality cycle tracks in UK, but I wouldn't hold my breath waiting for them to accept this evidence. Very powerful post. I wish the best of luck to the Embassy, and to all who strive for a truly better environment for cycling than the UK currently offers. The infrastructure is the key. If the canal builders, railway engineers and road builders had the "can't happen here" attitude we'd have no transport infrastructure at all. If there is a will to build infrastructure it does happen. We need to get behind the Embassy to create the demand to pressure central government.The health and economic arguments for a mass cycling culture are all there so I believe it really is just a matter of political will. 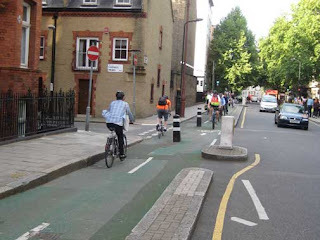 I read somewhere recently (hopefully I am not repeating your own words back to you) that the driving force for the construction of our roads as we know them today was in fact cyclists, looking for better surfaces than the preceding coach trails. This was before the motor industry came to dominate the roads, indeed it lasted until the inter-war years. Only after that did road design start to force out non-motorised users as roads got wider, faster, and corners and bends were ironed out. 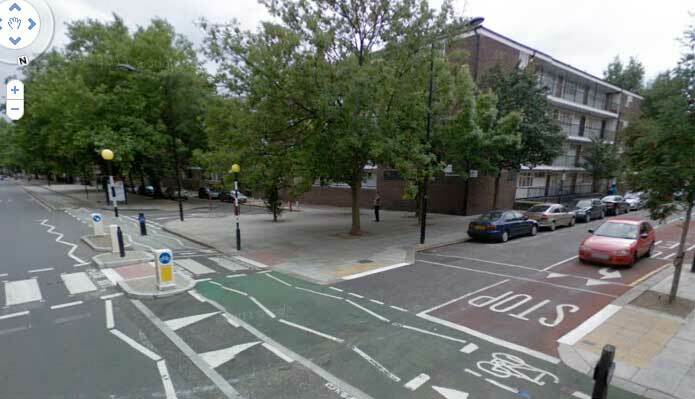 Meanwhile, when the first segregated cycle track was constructed alongside a now-hostile road (the A40? ), again around the time of the second world war, it was opposed tooth and nail - by the CTC! And so it was dropped. Cyclists were clearly a very influential lobby group before the advent of mass motoring. Is it too much to expect that they will regain some of that influence? One development we are seeing, albeit in a small way so far, is City Slickers who commute to work on a bike, and who are starting to make demands of their employers for parking space etc, and to become more vocal and more organised about hot topics like Blackfriars Bridge. Even LCC has read the zeitgeist and started to organise for Blackfriars, and to adopt "Going Dutch" as its main mayoral campaign theme. I kind of hope that another demographic shift will increase the momentum. The young and car-less. We constantly read how car ownership is becoming unattainable for many young people now. This is not because the cars themselves cost more - they don't, in fact in real terms they cost less, especially in second hand values - or even because of the cost of fuel, which might cause you to drive shorter distances or with a lighter right foot, but because insurance premiums are astronomical if you are under 25 and male (let alone unemployed). If young people can't afford cars, and wish to gain their mobility and their independence from "mom's taxi", what else do they have? Public transport, and for greater flexibility for shorter distances, the bicycle. Of course, our generation (I am just a little older than David) have no conscience about knicking the family silver to give ourselves free higher education or gold-plated pensions, so I am not counting on us making way for young people on the roads. Could we see student fees demos and disturbances extend to mobility rights? - It's pretty new - part of phase one of works on the Oxford Road corridor, so hopefully it'll be there for a while. - In contrast to some bits of disjointed infrastructure, this actually fills in a gap, helping connect the busy student area of Oxford Road to Manchester's biggest station Manchester Piccadilly. 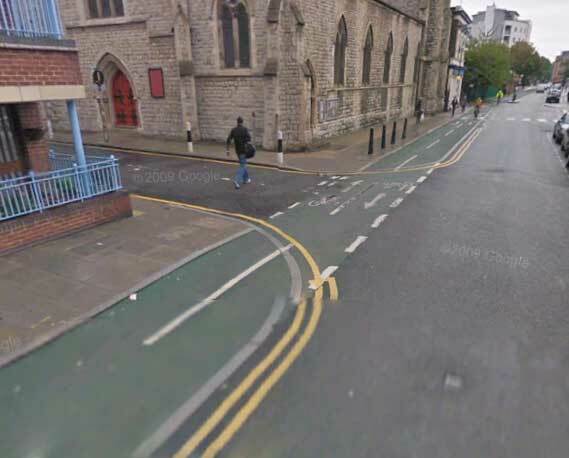 Oxford road has some crummy "cycle infrastructure", but I like this. Unfortunately, partly due to heavy parking, cars will of course cross the cycle lane and sit there waiting to edge out. Four or five years later, they are still getting it wrong !